Not dissimilar from Toy Story, Wreck-It Ralph is the good old Disney story of inanimate objects coming to life. In this latest of Disney's full-length animated features (not Pixar), we are privy to the lives of video game characters when the games are not being played. The game Fix-It Felix exists in an arcade, with it's villain Wreck-It Ralph, who is a good guy at heart and is tired of being the bad guy in his game. He abandons his game and travels to others in search of a new life as a hero. This is a very simple story about redemption and accepting your true calling, but the main attraction here is the visual landscape and literal eye-candy. The rules of their world and the creativity involved is delightful. There are some real games and references used throughout and luckily that wasn't their main comedic goal. Thankfully, the movie never turned into a lazy episode of reference-overdose Family Guy. The success of this film are the little touches and generic video game idioms: the pixelated backgrounds, the juxtaposition of retro-games against hyper-kinetic modern games, the stilted animations of characters who can only move at so-many-frames-per-second and the plethora of sounds and stylized music cues. Once you realize the majority of the film takes place in Sugar Rush, a Mario Kart-esque racing game in a world made entirely out of junk food, you needn't worry of boredom since the artists keep this world interesting in scene after scene. The details in the scenery (made entirely out of candy) seem so tangible and a joy to look at. There is an Oreo gag in particular that just about made the film for me. Aside from Ralph himself, mostly everyone is a one-note character. They don't evolve much, but at least their jokes are consistently enjoyable; like Fix-It Felix's charming optimism, Jane Lynch's bad-a** Sergeant and even the Sour Ball's sour...ness. 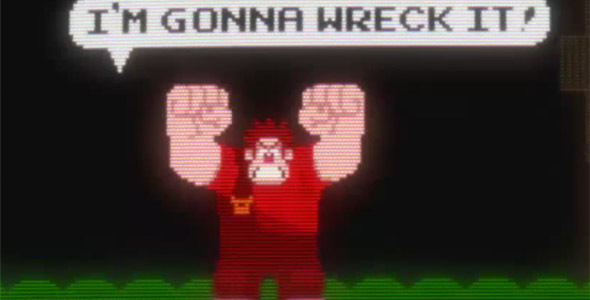 Despite having a very familiar story to tell (see also The Nightmare Before Christmas), Wreck-It Ralph is a very fun movie with stunning animation. Just like a video game, it is kinetic, vibrant, creative, while also being a simple episodic story based on a gimmick. Like another video game movie, Scott Pilgrim Vs the World, this is a spectacularly visually engrossing film with where the story takes a backseat on this comedic joyride.